some 175 ft long 24 ft in breadth and 10 feet in depth. In 1851 it was renamed the Mayflower. Then in 1861 the ship was refitted and renamed the Comet. On an evening in the year 1861 the Comet left Kingston in heavy winds to make the trip up the lake. Near the false Duck Islands it was run down by the Schooner Exchange. The Comet badly damaged and with out power was driven down wind in the direction of Kingston. 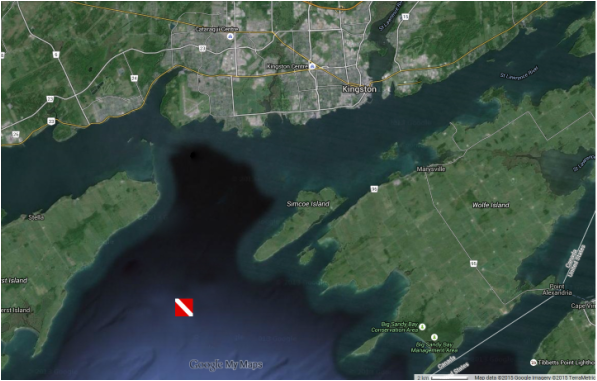 It finally sank 2 miles off Simcoe Island outside Kingston's harbour... It sits upright in 80 feet of water. 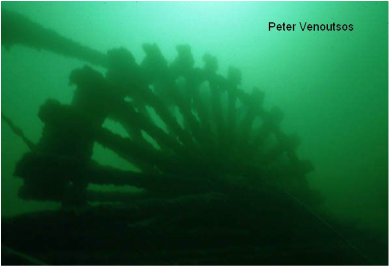 The propulsion devices of this 337-ton side wheeler still tower 25' above the bottom of Lake Ontario near Kingston. They are the most intact part of the ship, with much of the upper decks having been flattened.